You are currently browsing the tag archive for the ‘video games’ tag. I was feeling a bit nostalgic the other day as I slumped in front of my 360 blasting away mutants in full HD and reflected on the simplicity of video games of yore. The C64 was the first real computer we had at home. I remember my brother and myself pooling our money with our dad, to become part owners of this miracle of modern technology. And though it was used for the occasional database application or beginners’ lessons in basic, to me it always remained a gaming machine first. So in honour of countless rainy days spent loading games from tape or floppy, here’s my top 10 of best C64 games ever. These are only games I actually played, so a couple of classics may be missing. Placed poetically at number 10, this sporting game extravaganza became the ruin of many a joystick. Only our original arcade survived the arm-numbing rattling, as we went through one poorly rendered athletics event after another. Gameplay was pretty much limited to how fast you could move the joystick left and right or up and down, with the final 1500 meters run being particularly painful. Still an honorable mention. You are in a large cave. In front of you is a dragon. With what? You bare hands? 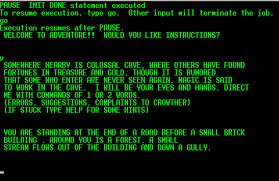 Text adventures. The original interactive stories that leapt onto our monochrome computer screens in the 1970s, promising to take you to a magical land where legends were yours to be had at the input of 2-word commands. Go west, pick lock, drop bottle. I played dozens of them, drawing maps by hand to make sense of the illogical spaces, where retracing your steps could lead you somewhere else entirely. One of the earliest ported to the C64 was the original Adventure, which for some reason we had in German, so it was a language course and computer game wrapped in one. This surely was the limit of modern gaming. One of the simplest games around. As a WWI fighter pilot you had to fly diagonally across the screen, taking out incoming baddies and dropping heavy ordinance on enemy arms factories. I’m putting it on the list just because we spent such an enormous amount of time playing it, getting ever further into German territory until you inevitably got shot down just before the end. The first game that got the mix of ascending difficulty just about right, as finishing it gave quite the rush. Now in all fairness I have to admit I played this game more on the Amiga than on the C64. On the latter the load times really got a bit on your nerves, but the core concept was still excellent. A knight in medieval England you go about conquering your neighbour’s lands, ransacking the odd castle and participate in jousting tournaments to woo your lady. If you ever wondered where those bodacious Evony ads get their inspiration from, it’s the original Defender of the Crown. One of the last games I actually owned on tape, which notched up the ratio of originally bought games to conveniently shared games to the 1% mark. Turrican 2 was simply excellent. Don’t ask me what the story was about. You played a Robocop lookalike, capable of such interesting transformations as turning into a moving circular saw, who had to shoot his way through a vast cave system. It had power ups galore, challenging boss battles and hidden bonus filled caves. Everything you still see in today’s 3d shooters. The first Role Playing Game I’ve ever played, A Bard’s Tale took place within the stone walls of the bustling medieval city of Skara Brae, where a stranger striking up a conversation in the local tavern, always led to intrepid adventures. Looking back at the game, which at it’s core was a straightforward dungeon crawl, I’m amazed at the patience video games once required. Not only did you have to map out dozens of large labyrinths by hand or risk going in circles for hours, but you were forced to manage character inventories, leveling up, and of course walk into the wrong dungeon and you’d get killed every two minutes or so. Still you were part of legend, bards sang songs of your brave deeds and many wintry nights went by in quest of Skara Brae’s deliverance. A quirky little game this was. Starting off as a lowly maintenance bot, you scour the corridors of a mammoth space ship for other droids to take over. The battle for command was handled by a one-on-one puzzle game, and the stronger your opponent the smaller the chance of success. Get control over an armed robot and you could blast others from your path. We never quite managed to finish the game, but reading up on it on Wikipedia, my conscience is clear. It apparently had no end. Somewhere in the eighties people began to realize that reading and typing your way through a text adventure was perhaps not the most engaging and visual experience imaginable, so when LucasArts came along and created the SCUMM engine, there was a collective iPhone like, wow moment. The Script Utility for Maniac Mansion changed the game. Instead of reading that the room was large, you could actually see that it was large. Instead of typing, you could point and click your verbal commands together. Yes, it was still clunky, but as a B-horror spoof it was also one of the funniest games ever. Game play became more open ended as MM sported multiple endings and different choices depending on the character you picked. The surfer dude, alas, was no match against the evil tentacle. Another game on the list purely by hours of game play. The story is a pixilated version of the Longest Day, cut up into 5 distinct levels. The first sees the player navigate his ships across a map to get close to the beaches. After this opening the most entertaining level has you shooting incoming aircraft out of the sky, after which a battle ship type altercation ensues with the enemy fleet. The last level I never cared for too much as battle moved terrestrial and you move your troops inland, but hey, after playing for that long, you’d have to give it a shot. Ahhhh, the frustration. You’ve just spent 10 minutes dodging and jumping across spears. The gate of the Aztec temple is in sight. The music has reached it’s climax. When. Crap! You push the joystick in the wrong direction. The player crumbles to the ground. You begin again. So many memories of this game, which by the way you shouldn’t play on a b&w television, because you can’t see the piranhas in the 6th level. It has all the hallmarks of classic C64 gaming. Music that sticks in your head. A random back story. And most importantly, oodles of frustration where every move can kill you and send you back to the start. Check out the video for the haunting, seminal score.